Good morning to all who pass by here :-) Brrrrrrrrr it's a cold one. I hope you're all tucked up in the warm today and all those that have been feeling poorly are now feeling much better. 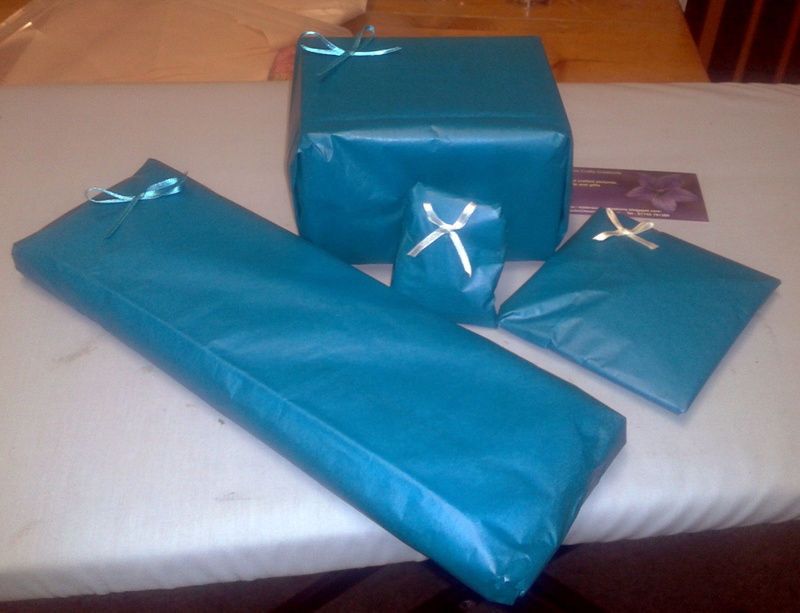 For those that haven't already seen....Crafty Womble was the lucky winner and these little parcels are now winging their way to her. Thanks to all that joined in the fun. We had a fun afternoon catching up with news, giggling and crafting [drinking coffee and eating chocolate!]. This is how we finished off a wonderful Monday. My two gorgeous girls, Brent and my 5 very special little people came to spend the evening with us. Our room was filled with fun, laughter and lots and lots of love. 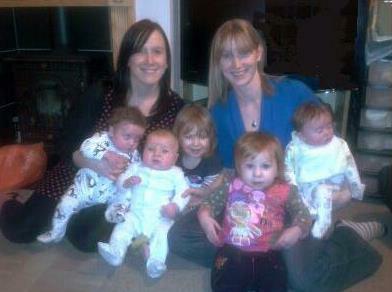 [from the left the babies are Sam [twin], Steve [youngest], Phoebe [eldest], Louise and Lexi [twin]. This picture really makes me smile.....I'm such a proud mum and nanny and I really love my family times. 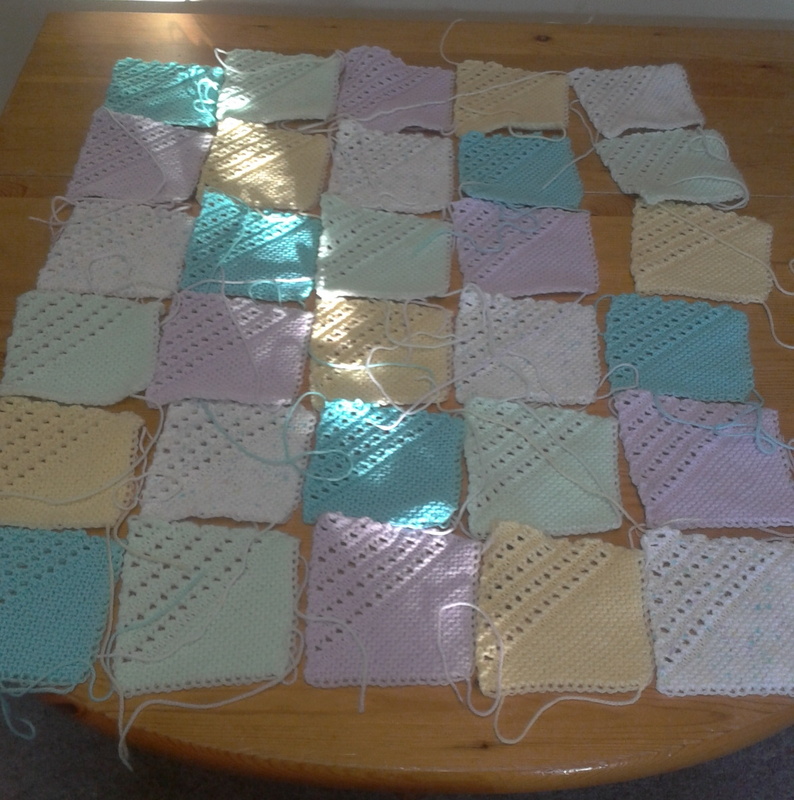 I stitched the squares into rows and then the rows of squares together in my chosen pattern. I have since spent my evenings crocheting the border round the outside.....I like to do 2 rows of each colour in double crochet to give a nice wide band and as you can see last night I finished it :-) I'm so thrilled with the finished result too. Can't you just see a summer baby wrapped in those sherbety colours? I hope you will all leave me a little 'hello' comment before popping over to see Julia and link yourselves in to the fun. I hope each and every one of you will stay warm and well and have a wonderfully creative week. Lovely family picture and the finished blanket is beautiful. Such a gorgeous post full of loveliness!! 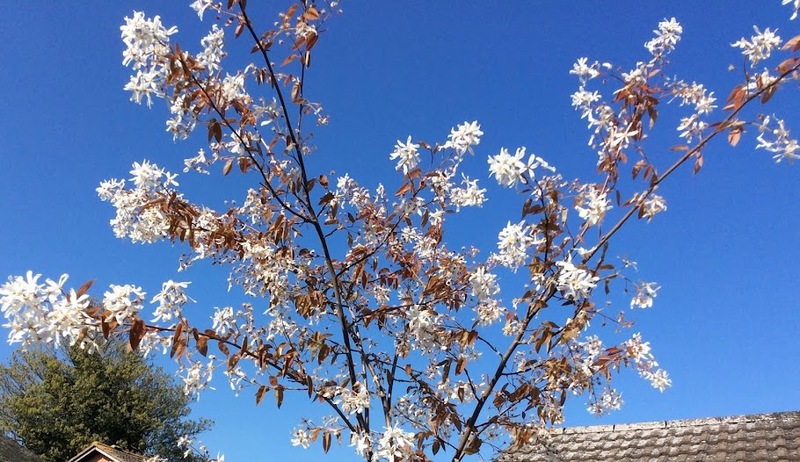 Great pics - sunlight not to be sneezed at this time of year! Love that blanket it looks soooo cosy!! Wonderful picture of all. You are so lucky to have them so close in distance to share time together. Great colors for the little blanket. Have a wonderful WOYWW and Bless you for all the little things you do for others. Wonderful pics of the family, those children are gorgeous. The baby wrap is gorgeous how do you find the time? Such a lovely post full of joy! That's my word for January.. .so I am seeking JOY and finding it too! What a treasure to get all that family photo. Something I don't have as we never manage to ALL get together at once. Love the blanket, that too is a treasure to bring more joy! Thank you for sharing a bit of your world with us WOYWWers this morning! I hope you have a wonderful week. The edging on the blanket really finishes it off. Managing to get 5 small people in one place at one time is no mean feat! How lovely to see your beautiful family. The blanket is looking fabulous. Just what's needed now that we seem to be having a proper Winter theses last few days! Oh what a lovely post - such nice pictures - love the one with all the kids and mommies! Your little blanket has come out wonderful! Hope to see the dolls soon! What a lovely post, Annie. You have the most beautiful family. 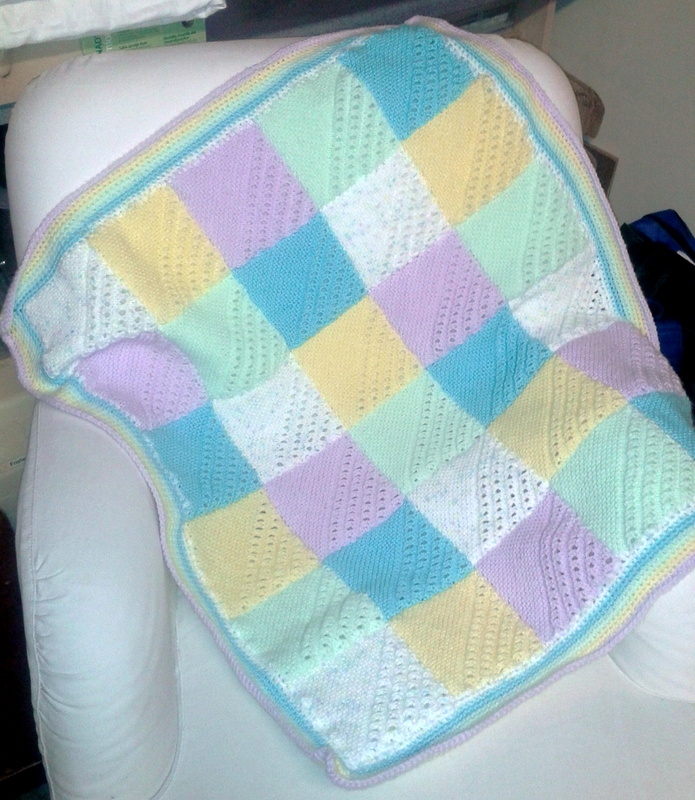 Your baby blanket is gorgeous, I love the colours. I have a special one made for my DD by her Grandma and it'll be handed down, they are very special. 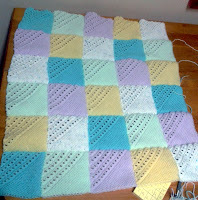 Loving that blanket - gorgeous pastel colours. Fab photo of the girls and the wee ones, what a treasure to have. 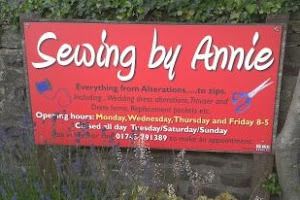 Annie - what a lovely post, you do make me smile. Love the blanket and of course the lovely photo of your daughters and grandchildren. love your little dolly, your family pic and the blanket is so pretty! Such a hectic life Annie but as you say, one filled with love and a lot of laughter and that's very important. 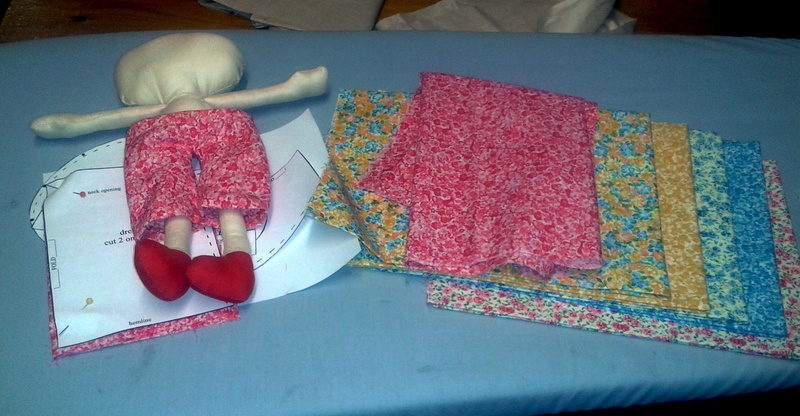 Love how the blanket finished up, very pretty, and good luck with the little dolly! Hope we get to see dolly with no name finished. Those babies are growing up so fast. A joy to behold. Don't know how you find the time to pack so much into your days. The blanket looks lovely. Hugs Mrs A.
Oh the finished baby blanket is adorable -- and everyone in that photo is too! PS As usual, you've been one busy lady! Aw! Such a gorgeous photo of your littlies big and small. Nice blanket too - do you make in my size? LOL! I love the blanket! I haven't tried making a blanket yet..but maybe someday! Beautiful blanket you knitted and cannot wait to see the finished dollie too! That is a gorgeous blanket ...is it for an expected baby? I really believe that you have more hours in your day than the rest of us poor mortals... because you manage to get so much done!! Can't wait to see the finished doll and your baby blanket is stunning!! 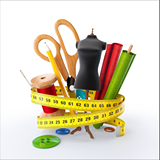 Wow you have been busy, thats a lot of cutting! Love the family shots (so cute) and the blanket looks so cuddly. LLJ told me about this gorgeous blanket yesterday so I popped in to see and it really is lovely! 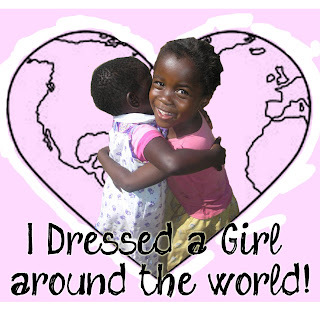 I am in love with those teeny prints you are dressing the dollies in. I keep meaning to make my girl one but I see so much on these blogs that I want to do and just never get around to half of it! The family photo is just gorgeous- I love time spent with my family-two sons, two lovely daughters in law ( like daughters) and two granddaughters and two grandsons- such precious times when w get ogether. Awww... cutie patootie babies and a gorgeous baby quilt to boot! I love that small print fabric your daughter gave you. Fun times! Lovely happy family picture. The blanket is gorgeous. What a great picture of a beautiful, happy family. Love the blanket, soft and gentle colours, perfect. Look forward to seeing the dolly develop. Thank you for sharing all your lovely photos. The finished blanket is fabulous!